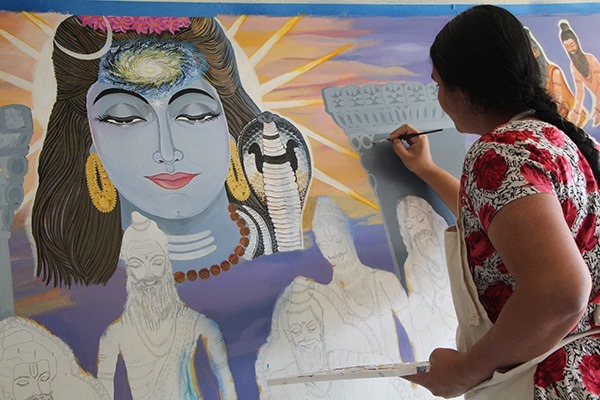 Earlier this past summer, Anandhi approached Nome requesting permission to express her devotion through her artistic abilities. 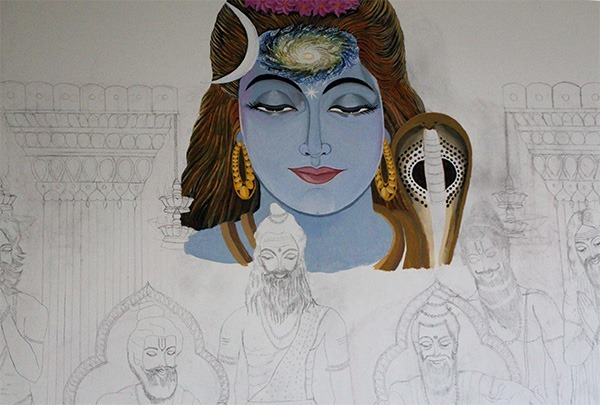 The idea of painting a mural on the wall in the Lotus Room of Vasistha instructing Rama along with the assembly of numerous other sages was suggested. 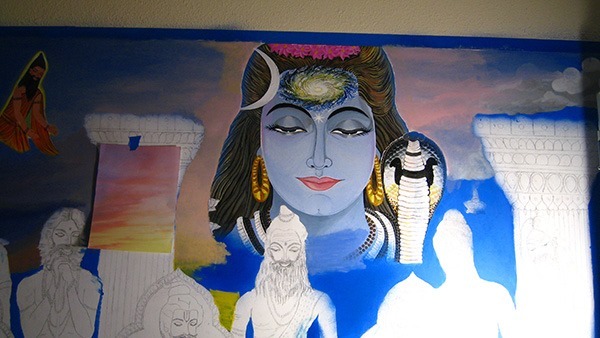 As Vasistha is part of the Advaita lineage, our linage, and dear to our hearts, it seemed most appropriate. 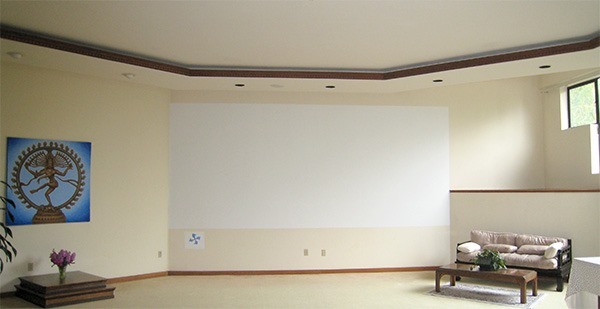 Below are images of the progress of this holy endeavor since its inception. 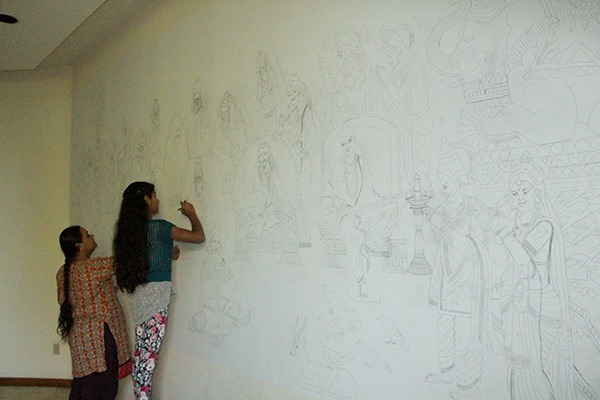 First, Anandhi draws the image in pencil on poster board. 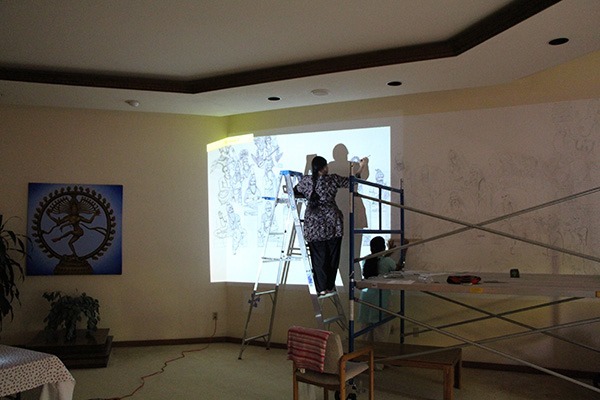 Every detail is drawn carefully. 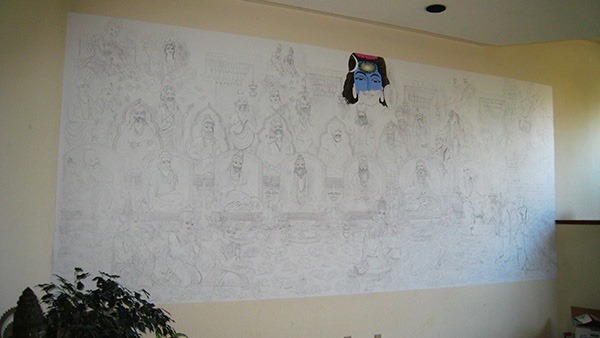 The wall in the Lotus Room where the mural will be painted is prepared. 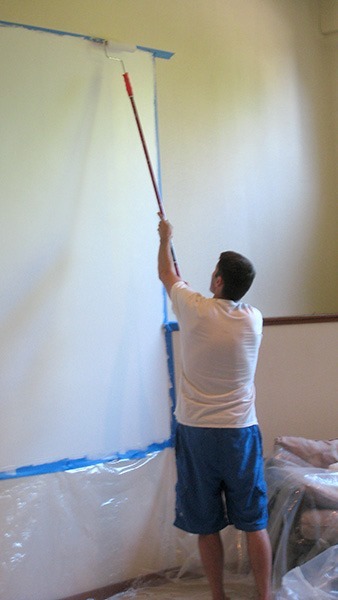 Scott places “mud” on the wall to smooth the surface. 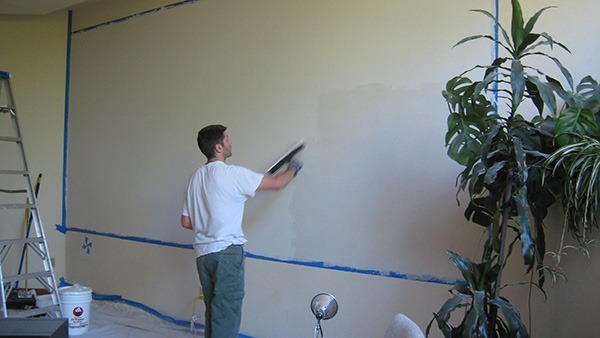 After adding mud he sands the wall to obtain an even smoother finish. 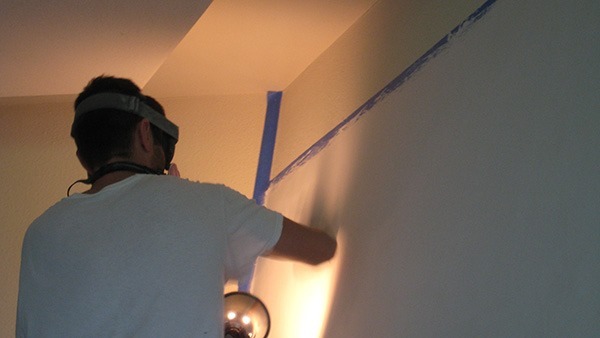 The process of adding mud and sanding is done multiple times. 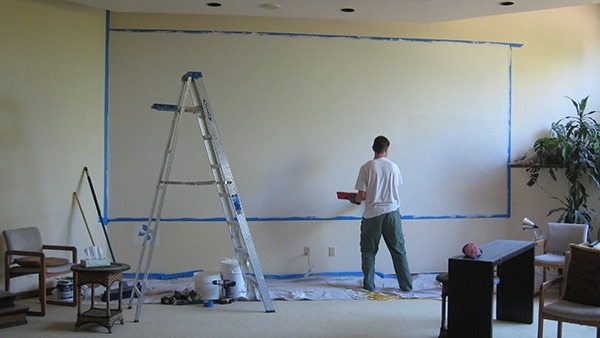 Then paint is applied. 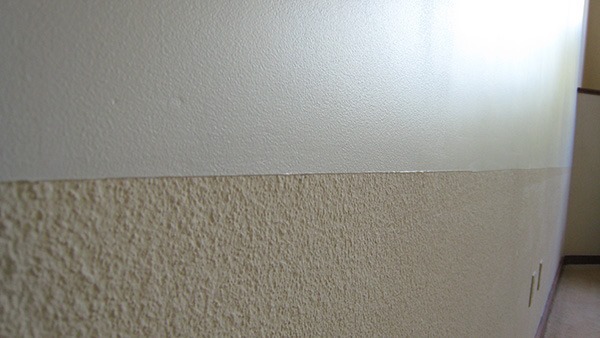 The difference between the original wall and the prepared wall is easily seen here. 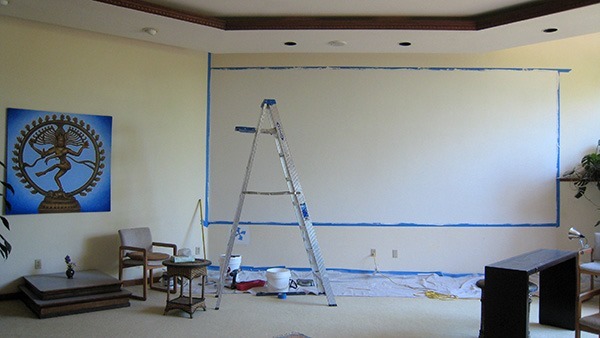 The surface of the wall is now ready for the mural. 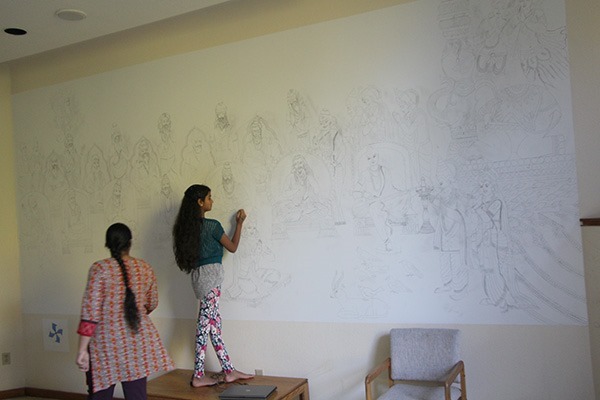 The drawing is projected onto the wall and Anandhi, along with Jayalakshmi and Sangeeta draw the image onto the wall. 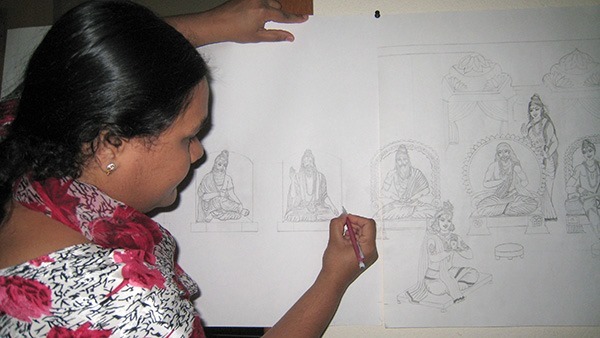 Here, Janani helps her mother, Anandhi, with the drawing. 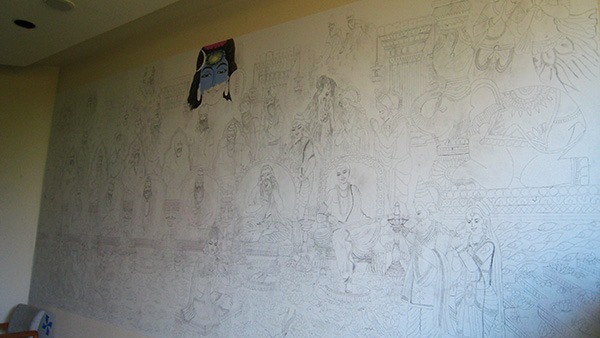 The image is complete and ready to be painted. Anandhi starts with Siva. 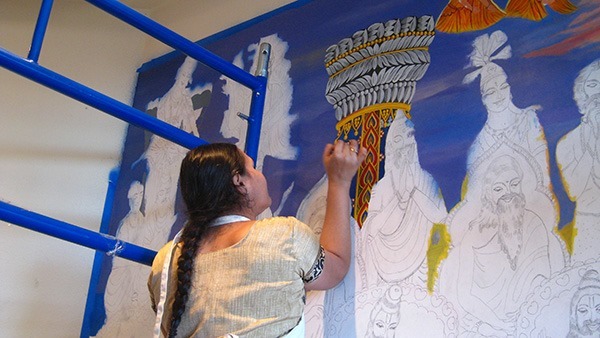 Then, Anandhi paints the sky. 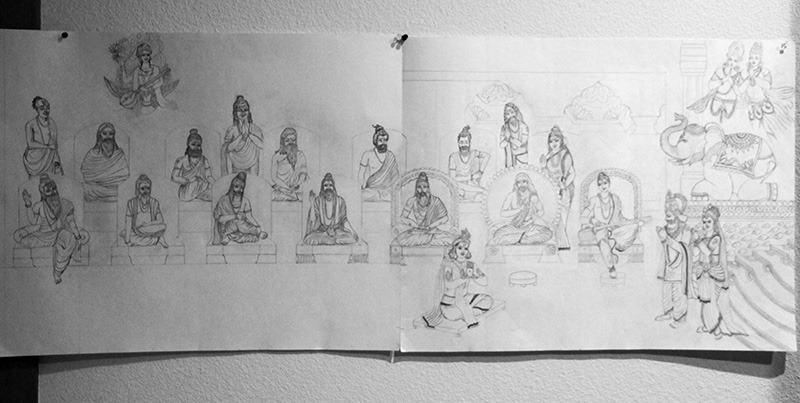 One of the Siddhas can be seen in the upper right hand corner. 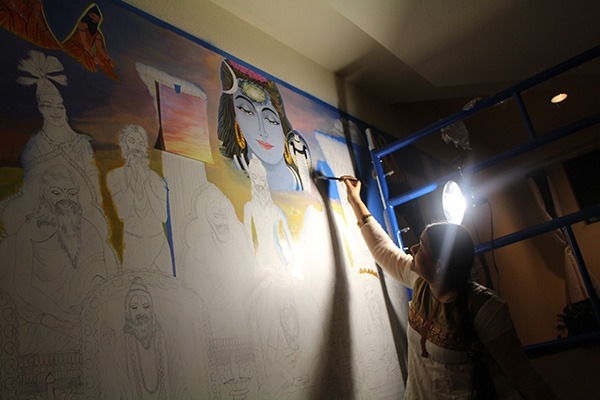 Next, Anandhi paints the sky behind Siva to represent a beautiful sunset. 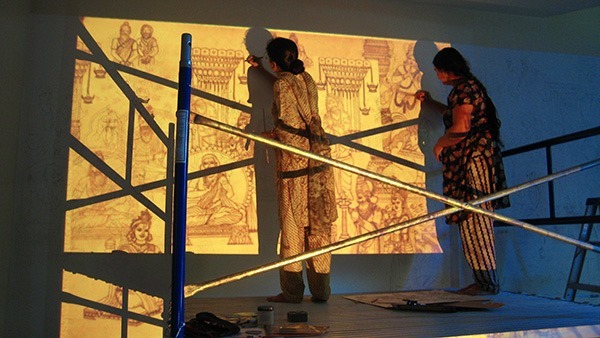 Anandhi often works at night when baby Ribhu is sleeping. 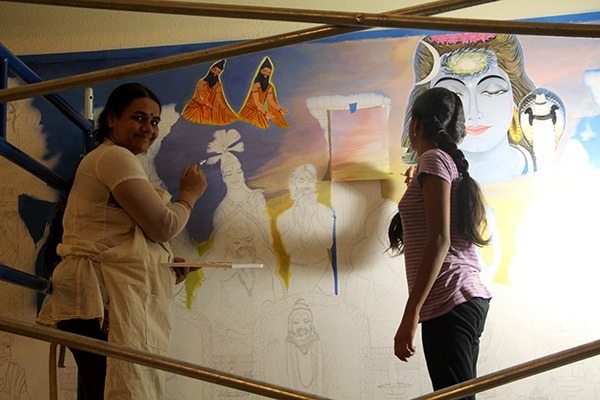 Here, Janani helps her mother paint. 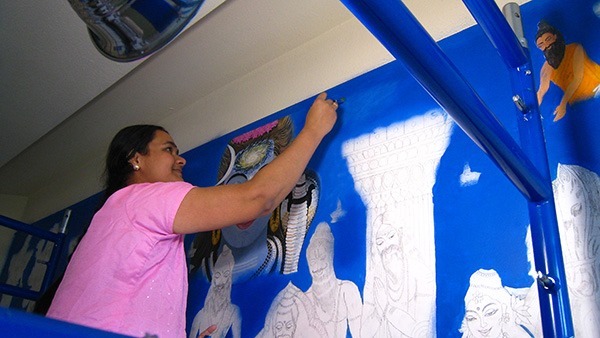 Janani is an apprentice painter learning from her mother. 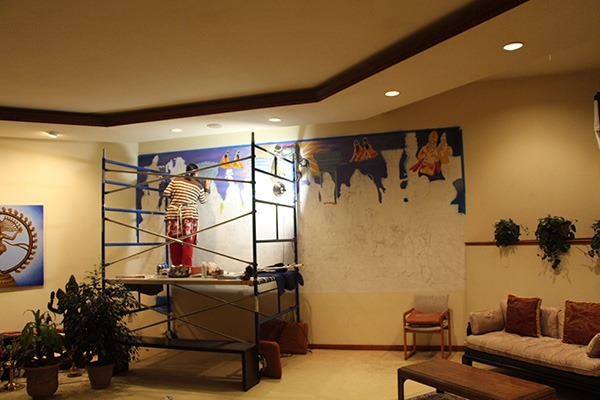 Next, the columns are painted. 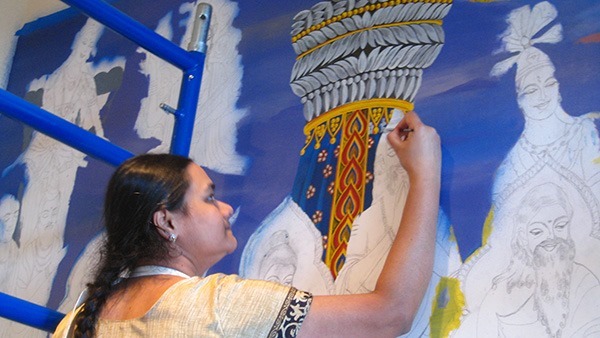 Anandhi takes great care in every detail of the painting. 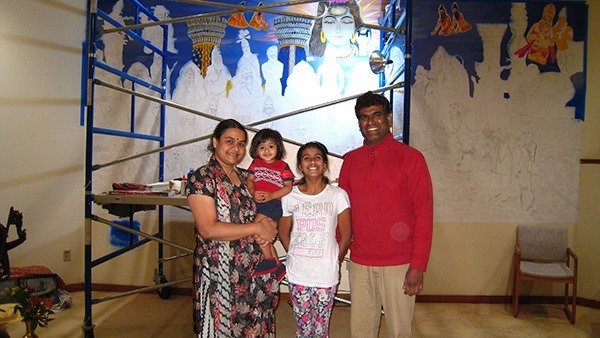 This is Anandhi with her husband Siva Kumar Chandran and their two children, Janani and Ribhu. 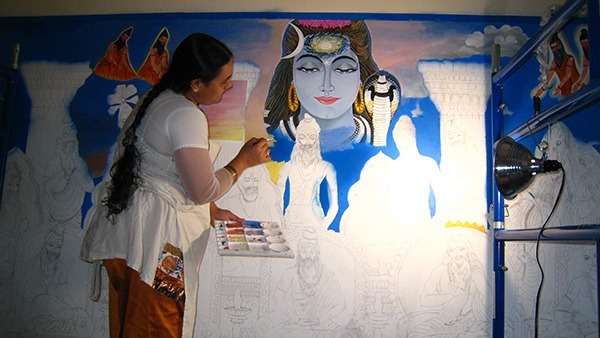 When Anandhi completes this offering we will post another blog here. Very beautifull! Just one small tking I dont understand. Ketaki flowers were banned by Lord Shiva after supporting Lord Brahma in telling the lie of reaching the top of the collum of fire. 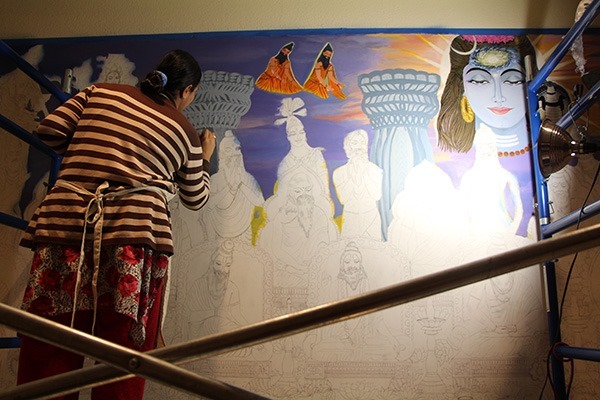 Should they be on that beautifull painting? 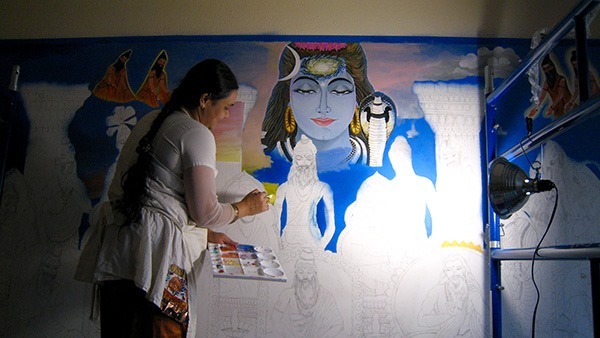 Thank you for visiting our Temple Blog and for your message. 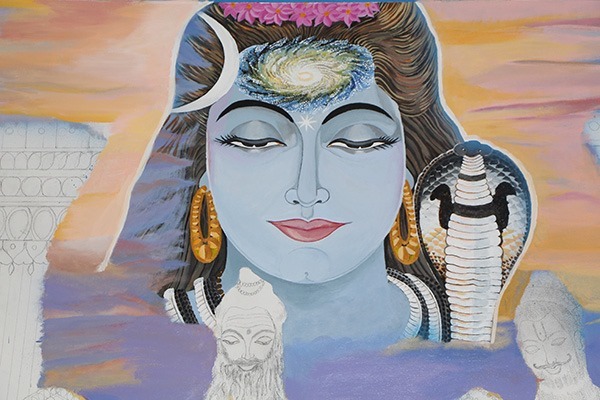 Yes, we are familiar with the story as it appears in the Siva Purana. 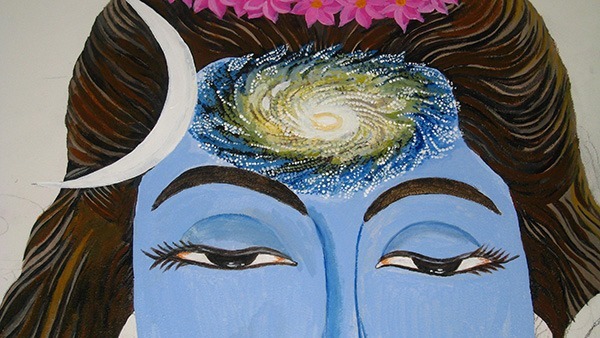 In the section of the Siva Purana entitled, “Vidyesvarasamhita,” chapter 8, verses 19-21 at the conclusion of the story that you elude to, Siva declares to the ketaka flower, “It is not proper for me to wear you. I am the Lord and my words must stay true. My attendants and followers shall wear thee. Hence, thy birth shall be fruitful. Of course, in the canopies over my idol you can be used for decoration.” The Lord thus blessed the three—the flower ketaka, Brahma and Vishnu. He shone in the assembly duly eulogized by the Devas. 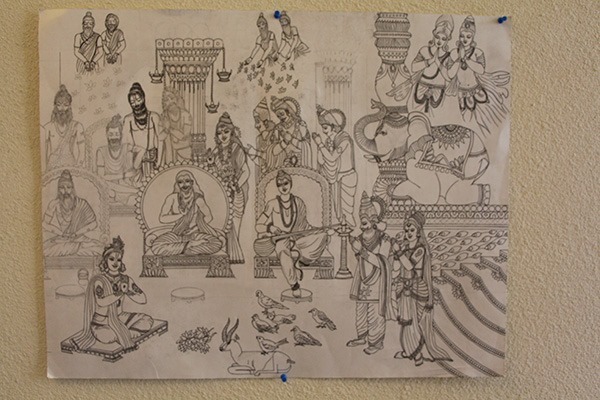 The story in Yoga Vasistha in which Vasistha instructs Rama in the company of the assemblage of numerous other sages and devas takes place in a palace and it is this which has been depicted by artist Anandhi Muthukumarasamy. May we all abide in That which is the Truth, the Good and the Beautiful.